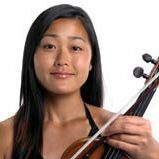 Born in Japan, Natsuko began playing the violin at the age of three and won a full scholarship to study at the Yehudi Menuhin School in England when she was eleven. She received direct guidance and teaching under Lord Menuhin and Wen Zhou Li. She continued her studies at the Curtis Institute of Music in Philadelphia and graduated from the Royal Northern College of Music in Manchester with distinction in 1998. She has won many prizes in international competitions including the Wieniawski, the Yehudi Menuhin and the Tibor Varga. She received the Gold Medal in both the prestigious 1994 Shell/London Symphony Orchestra Competition and the Orchestra Ensemble Kanazawa Award. In 2007 Natsuko was presented with the Iwaki Award for outstanding achievement as a Japanese artist. Natsuko has appeared frequently at major international festivals throughout Europe, U.S.A, Asia and Australia. As a chamber musician she has collaborated with artists such as Yehudi Menuhin, Heinz Holliger, Stephen Kovacevich, Brett Dean, Stephen Osbourne and Christina Ortiz. In 1993, she was honoured to perform solo in the presence of the Queen and the Royal Family at Buckingham Palace. Her debut recital at London’s Wigmore Hall in 1998 with Freddy Kempf received widespread critical acclaim. In great demand as a soloist, she has appeared with many world renowned orchestras including the London Symphony Orchestra, Philharmonia (London), Halle Orchestra, Odense Symphony (Denmark), Tokyo Symphony Orchestra, Tokyo Philharmonic, Orchestra Ensemble Kanazawa, Hong Kong Sinfonietta and Adelaide Symphony Orchestra. She has worked with many leading conductors and formed a special relationship with both Yehudi Menuhin and Hiroyuki Iwaki over many years. In 2001, she became the leader of the Australian String Quartet and subsequently was first violinist with the Grainger Quartet. Natsuko is currently the concertmaster with the Adelaide Symphony Orchestra and performed as a soloist with the Melbourne Symphony Orchestra in July 2009. Natsuko has given many world premieres of works by Australia’s most prominent composers. She has recorded for Virgin Classics, ABC Classics, Melba Records and Tall Poppies.